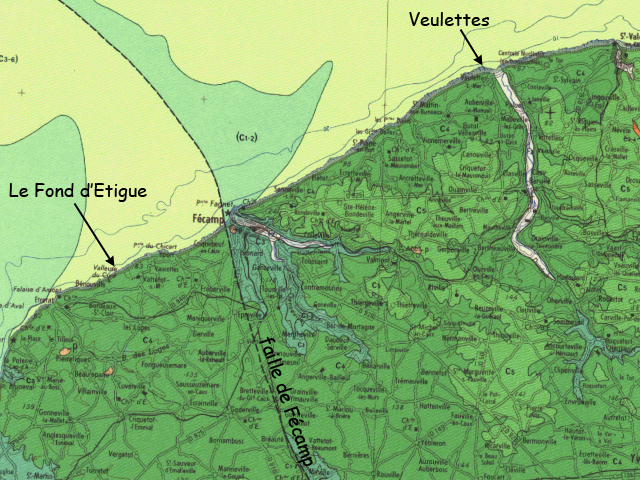 The sub-block of Ailly, in him E of Fécamp to Dieppe. Considerable differences exist in the stratigraphy of these two sub-blocks. In him W of Fécamp, the stratigraphy concerns almost exclusively lower and more average Coniacien (pointements of Turonien is locally visible, as well as upper Coniacien is present in high cliff near Fécamp but it is inaccessible). In him E of Fécamp, we travel a continuous cup of Turonien lower than upper Coniacien (the limit of the section is Veulettes). Coniacien is best represented to it and most accessible of all the Norman cliffs.